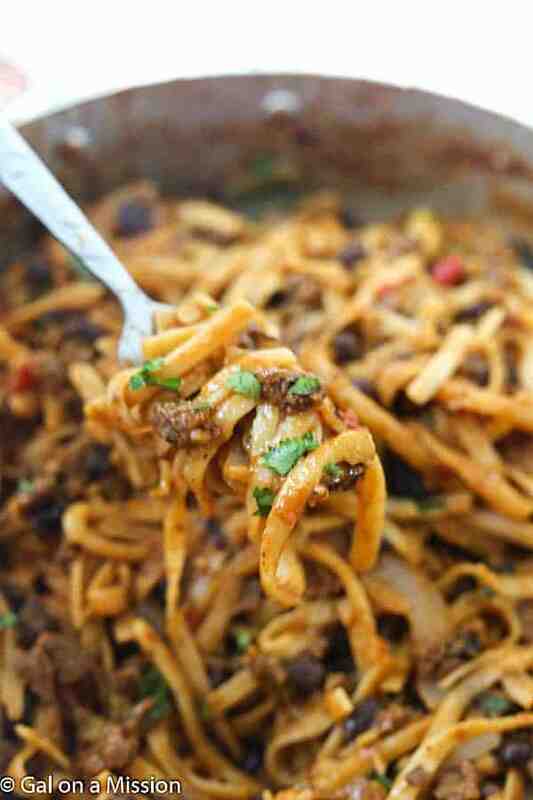 15-Minute One-Pot Taco Pasta – Everything is made in ONE pot in just 15-minutes! 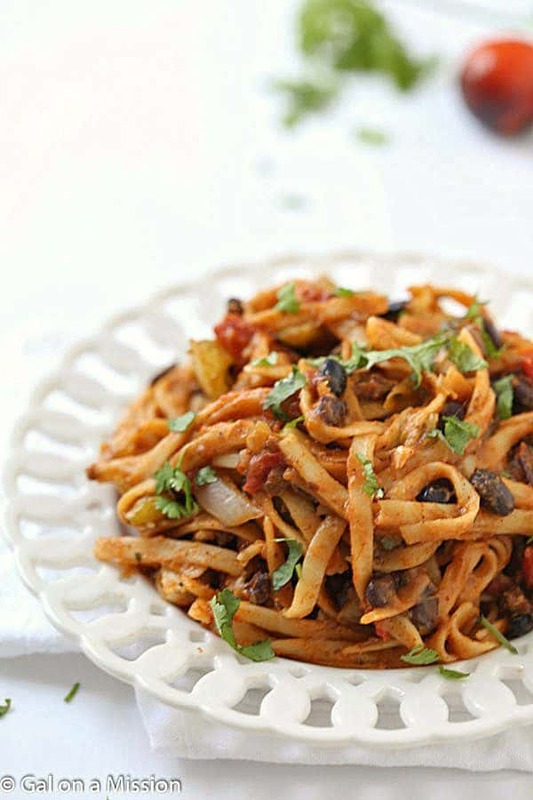 Perfect for a tasty and quick weeknight meal! Who else is in love with incredibly easy and tasty weeknight meals? Come on, raise your hand! I would assume everyone, including myself, is a fan of easy and tasty. Especially during the summer and the week. I think we all would rather enjoy our family after a long day or company when entertaining. Today I have the meal that fits all of the requirements. Only 15-minutes from start to finish – check. Everything cooks in one pot – check. Incredibly tasty – check. Told ya! The best part of this pasta, besides it being easy, you can even bring it outside for easy outdoor entertaining. It has everything you would ever need in a meal. To make this pasta even easier, I used HORMEL® TACO MEAT Beef Crumbles. They take an ordinary taco night into a taco fiesta. They are quick, easy, affordable, and tasty! Not only are they fully cooked, but they are seasoned perfectly. No matter the occasion, Hormel can help to make your meal delicious at an affordable price. Hormel Foods even offers coupons, even a Hormel Newsletter! Make sure to sign-up for their newsletter while you are printing your coupons! Looking for other Easy Recipe Ideas, Hormel offers all kinds – the maple bacon monkey bread looks fantastic. One of our favorite weeknight meal options is one-pot meals, especially simple one-pot pasta done two ways: red and white sauces. Lately, I have been using my brand new enameled cast iron dutch oven! It’s the best for one-pot pasta dishes. 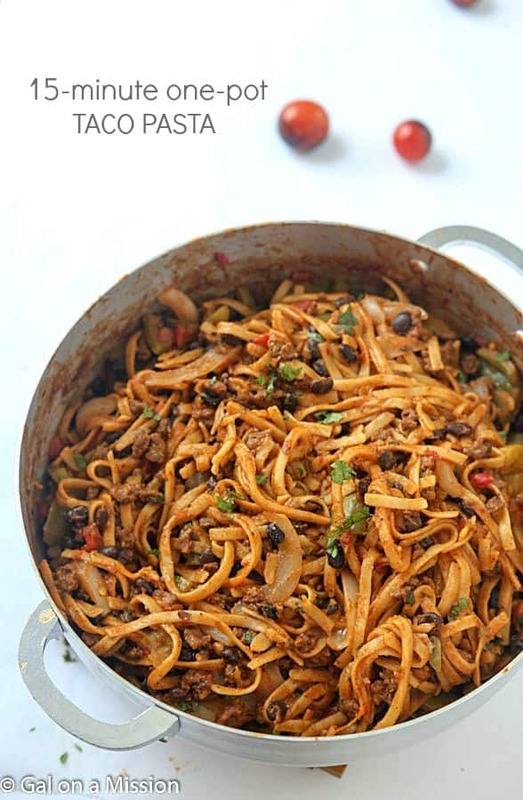 Place the noodles, diced tomatoes, green chilies, onion, bell peppers, black beans, taco seasoning, taco sauce, and beef crumbles into a dutch oven. Pour the beef stock in and mix. Allow the mixture to simmer over medium-heat for 15-minutes or until pasta is tender with no lid. 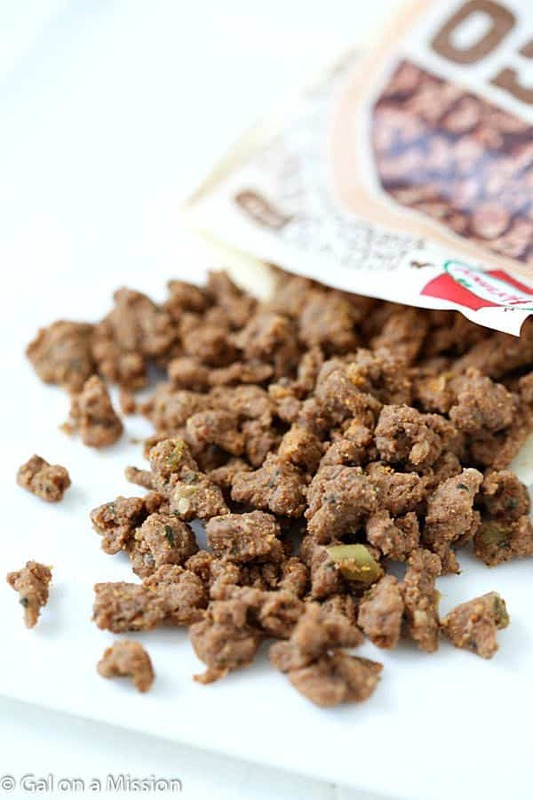 Question…is it really 2 lbs ground beef instead of 12oz of the crumbles?? That seems like a lot of beef to replace only 12oz. This looks like a great recipe. I don’t eat meat, but I’ll bet the crumbles could be replaced with vegetarian crumbles. Thanks! This sounds delicious! I’m assuming the ground beef should be browned and drained before adding it to the pot? Thanks! You are correct, Bethany! Enjoy! I edited your “need” to beef” I hate those silly autocorrects! Made this tonight, and it was delicious! We also topped it with some shredded cheese. I will definitely make this again. Thanks! Yum! So glad you enjoyed it, Bethany! Should the noodle be boiled first before placing them in the pot with everything else? 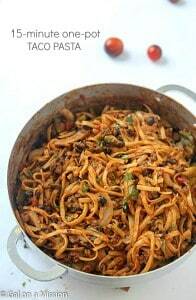 No need to boil the noodles first, everything will be cooked in one pot. Enjoy, Braton!